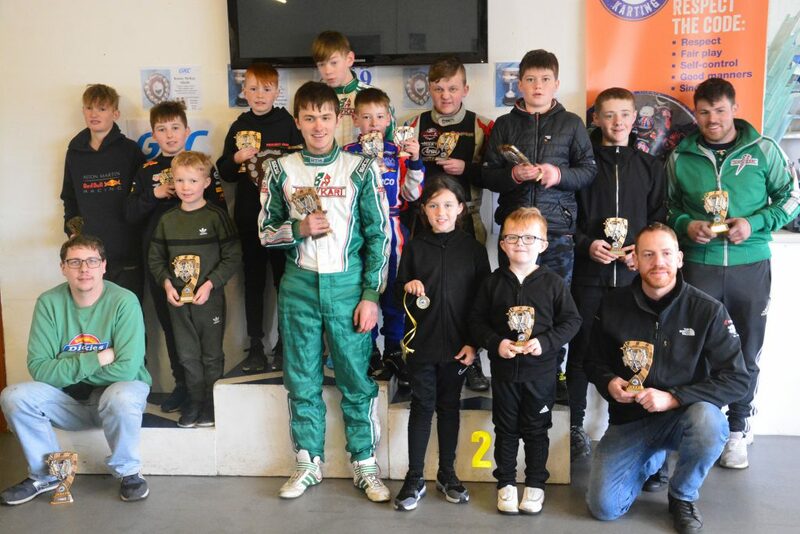 The first round of the GKC Motorsport UK Championship took place on Sunday 14th April at the Boyndie Drome Circuit. Dry with a cold wind was the weather conditions. The feature trophy was the Kenny McKay Shield for Cadet and Junior drivers. Cameron Mcphee took the early lead from Fraser Ballantyne and opened a comfortable gap. Late in the final, Ballantyne closed in on Mcphee, setting fastest lap, to 0.1 seconds as they crossed the finishing line. In the 177 class Stuart Wyness got ahead of Robert Strachan and when Strachan half spun at gate corner, confirmed Wyness as victor. Pole man Max Taylor took the early lead. Aston Sharp was in second closely followed by Alex Hawcutt. Lap three Hawcutt moved to second. Lap later at pit corner Sharp was down the inside to take the position back. Hawcutt tried to get back on the inside on the run to the finishing line but the two clipped causing both karts to spin out. This allowed Lennon Allardyce and Lucas Ross Cameron through. Sharp was quickest to get recover and started to chase. First he caught Cameron and a lap later Allardyce. Meanwhile Taylor was well away to take the victory by 5 seconds. Sharp took second from Allardyce, Cameron, Ella Matheson, Hawcutt and Sonny Brandie. Les Taylor stopped just after the start line with mechanical problems. Leon Henderson took the lead at the lights setting a hot pace from Jack Mackay, Jonathan Edwards and Chloe Grant. Henderson took the victory and set the fastest lap of 37.522 seconds. The order did not change as Mackay, Edwards and Grant. In the Mini Max Class Darren Guiljt took a comfortable victory over novice Nathan Smith. Close victory for Gary Williams in the gearbox class from Ryan Simpson and Alex Mackay and Charlie Mackintosh. The front three were separated by a second with Mackay setting the fastest lap of 30.060 seconds. GKC Chair, Fraser Edwards, presented trophies after the meeting. Next race meeting takes place on 12th May 2019.